The health care sector is the second most attacked sector by ransomewares after the financial sector. Health information not only contain patient health information but also crucial financial information such as social security numbers. Unfortunately many healthcare organizations are extremely vulnerable. Their computers operating systems are often outdated and they are not prepared to face criminals holding patient’s information hostage and expecting payout in exchange. Last month a sophisticated group of hackers operating under the name “Dark Overlord”stole pictures from a high profile London plastic surgeon that included pictures of in-progress genitalia and breast enhancement of patients. Patients include celebrities and members of the royal family. The hackers also attacked numerous medical centers in the US last year. Failure to proprely clean, disinfect or sterilize flexible endoscopes after use can cause deadly infections. Flexible endoscopes are manually cleaned and the negligence of an employee can lead to the death of a patient. Endoscopic material needs to be manually cleaned of all biologic debris and other foreign material. If some residual soil subsists, it will make the disinfection process ineffective. The most important step in the cleaning process is the inspection. The ECRI Institute recommends that the person in charge of the inspection use magnification tools and biochemical testing. Dry storage is also essential as moisture helps proliferation of any bacteria not eradicated during the reprocessing. Mattresses and stretchers are always covered with mattress covers. The covers are supposed to protect the patient from being contaminated by previous patients germs. While covers are cleaned and disinfected between patients, mattresses are not. During the cleaning and the disinfection process of the covers their integrity can be compromised. A compromised cover can lead to the contamination of a mattress by body fluids or microorganisms putting following patients and medical staff at risk of being contaminated themselves. Healthcare organizations have been more and more relying on alarm notification systems that send timely patient health information to the appropriate clinician on their cellphone or other personal electronic device. Unfortunately these systems are not always reliable. Inappropriate configuration, with the systems themselves or phone freeze have led to delay or failure to deliver the alarm ultimately resulting in delayed care and harm to the patient. Healthcare organizations using such systems must make sure to proprely configure the system, to test and validate the implementation and to assess the integrity of the system on a regular basis. Many high tech medical devices have components that are extremely sensitive to chemicals and require specific cleaning agents and cleaning methods. To clean a medical device with an inappropriate product can damage components and ultimately result in equipment failure, power supply interruptions, incorrect alarms or unexpected device operations. Healthcare facilities must make sure to store appropriate cleaning agents for each device. Additionally, cleaning crews need to trained on the cleaning process of each device. For more than 40 years the ECRI institute has been warning OR staff about the risks of inadvertent activation of electrosurgical unit (ESU) active electrodes. Despite the multiple warnings, accidents such as burns, arcing and fires continue to occur in the OR because the doctor or other OR staff places the active electrode pencil near the patient instead of a non conductive safety holster. The holster is usually supplied with the pencil and the added costs associated with its usage are minimal. Digital imaging tools are unfortunately not always proprely used. Patients who are exposed too often can develop cancer and those who are exposed to an excessive radiation dose can suffer from burns. As tools are getting more and more sophisticated, users need to be trained to use the tools adequately to protect themselves and the patients from unnecessary radiation. Bar coded medication systems are supposed to reduce medication error. Scanning the bar code on the patient’s wrist and checking that the medication provided is the correct one before administering it to the patient reduces the risk of medication error. However if the staff doesn’t follow the workflow and administers the medication before scanning the patient or scan patients’bar codes from a list of stickers on a clipboard, the system will not protect the patient. 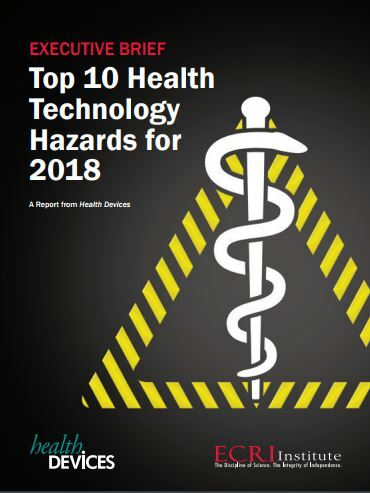 Healthcare establishments who do not adhere to best practices when implementing networked medical devices expose themselves to potential communications errors as well as incorrect or incomplete data transfer that can put patient safety at risk. Several deadly cases of feeding tube connected to the wrong line were reported to the ECRI Institute. In one case, a clinician connected a patient’s feeding tube to a ventilator suction catheter delivering enteral nutrition into the patient’s lungs and killing him. In another case the feeding tube was connected to an IV line delivering enteral nutrition into the bloodstream of a pregnant woman. Both the woman and the fetus died.